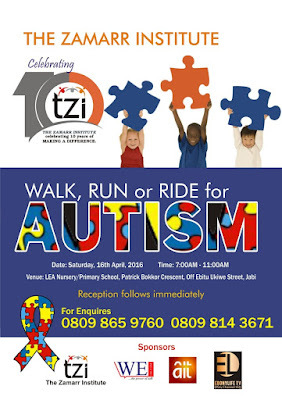 T‎he Zamarr Institute is celebrating 10 years of service delivery to children and young adults with Special Education Needs especially Autism and other related developmental disabilities. Day 1- The invisible disability and the society. Day 2- Early Intervention, and tools for communication in engaging children with additional needs. 2016, to observe the World Autism Awareness month. The United Nations in 2008 declared April 2nd as world autism awareness day. The whole month of April, the world over is used for Autism awareness. Since 2006, the Zamarr Institute has been providing autism awareness. Our first journey was in 2006 to Cape Town, South Africa when we took representatives from the Federal Ministry of Education, and the Federal Ministry of Women Affairs to the World Autism Congress. In 2007 and 2008, we invited the Autism Chair, Professor Tony Bailey, from the United Kingdom to provide training for medical practitioners from the National Hospital Abuja, the Central Bank of Nigeria and paediatricians from the Lagos State Ministry of Health. TZI has been quite visible in Nigeria as a whole as we have held training workshops for teachers in private and public schools alike in the FCT, Lagos, Bauchi and Kano. As part of our efforts to sensitize Nigerians, we invited successful people with Autism to Nigeria. Tony DeBlois, a blind Autistic Music Savant visited twice and Thomas Madar, a computer software programmer who visited once. We are thankful to our sponsors who have made all our activities possible. Our goal is to build a World Class Centre providing training for professionals in the field of Special Education to meet the best practice global standards, and to provide special education for up to 100 day, and 30 residential children and young adults from within and outside the FCT. We are working tirelessly to provide awareness to reduce the stigmatisation of the mentally challenged.